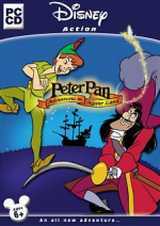 Join Peter Pan in a daring adventure through Never Land. Explore over 20 extensive levels, find pieces of a mysterious treasure map, and meet all your favourite characters including Tinker Bell and Captain Hook. Clash with Hook's pirates and free the Lost Boys from their traps along the way. You will meet enchanting fairies, swashbuckling pirates, cunning crocodiles and the fearsome Captain Hook in a final duel of good versus evil.